There are many great adventures to experience on or near the Ohio River. One of the most exciting of those adventures is a kayak paddle to the "Lost Ghost Ship." 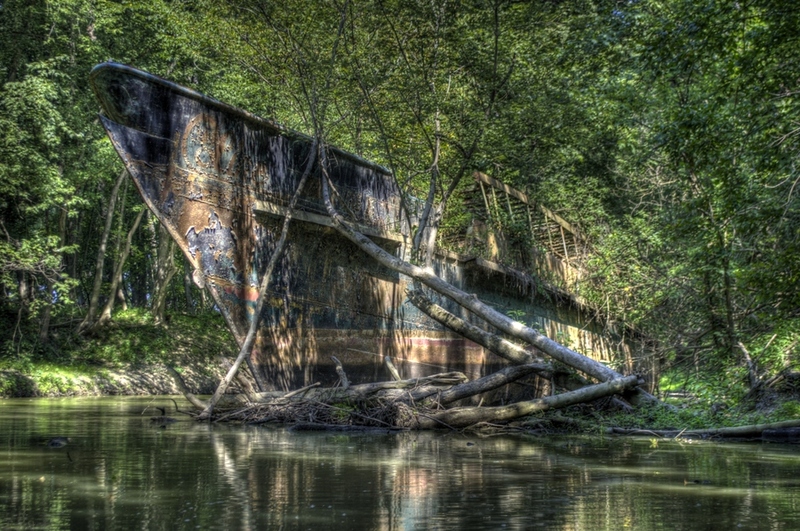 The history of this abandoned, 186 ft iron hulk is nothing short of amazing. The ship, built in 1902 and launched as The Celt, has served so many roles throughout its long and productive life, including a tour ship on the Hudson River and serving our Country when appropriated by the government in World Wars I and II. As the vessel has been bought and sold, she has been renamed to the USS Phenakite, Sightseer, Circle Line V and the Sachem. The legend has it that the government assigned the ship to Thomas Edison on which he performed oceanic communication experiments in the Caribbean. However, despite the illustrious past, the great ship, according to maritime experts, simply disappeared in the early 1980's, only to be "found" decades later, abandoned and partially sunken in a small tributary off of the Ohio River (just west of Cincinnati). 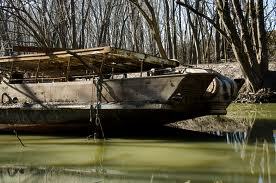 How the ship ended up in a small tributary (Taylor Creek) of the Ohio River in Kentucky is a story shrouded in mystery. However, what we do know is that we are organizing a trip next spring to visit and video this lost treasure.....Stayed tuned for more information and, of course, if you have already visited please share comments. Very cool. If yo have some pics, we'ld love to see them. We're going in the spring. We will be posting info on the Brooklyn Ship in Kentucky. Have you been there? How is the easiest way to find the old ship? What is the best drop in to get to the ship? The D' Andrea La Rosa Foundation in Lawrenceburg, Indiana has custody of the vessel. If you are planning to do this you should probably talk to them for permission first, also because it's moored to private property. They have unsuccessfully thus far tried to get money for repairs through the Raise the Sachem campaign and don't have a project lead at present due being busy with other stuff like art. They have the artifacts rescued from the ship, BTW, NavSource has updated her history since they have gotten a recent update. Also, be respectful, she's over a 100 years old and has served as a warship in three wars and is only off the reserve warship list because they thought she had been cut up. Another update: An affiliate of the Smithsonian has her original 1902 construction drawings. When the creek is at a low level see how deep the water is inside the ship. This will give the elevation on the hull of any holes. Ok I'm try to plain a trip. Is there a place to camp and put in that area. Are there any official tours (kayak or otherwise) to see this? Don't own a kayak yet but will be visiting in a week and would love to check it out. The ship is privately owned and is on private land. The ships wartime captain is still alive and the helmsman lives near Cincinnati. The marine engineers say there is enough info to build a computer model from her drawings to patch and refloat her, most likely to barge as a temporary drydock as old boat flippers do. I didn't get a reply back from the owner. The phone number is on the side of the ship. Please beware if you plan to visit the Sachem aka Ghost Ship. It is NOT ABANDONED. You shall not board the ship. It is fine as long you paddle around quietly but the land around the ship is not a park it's like your backyard. Please respect the owner who do not want visitors violating the property ! 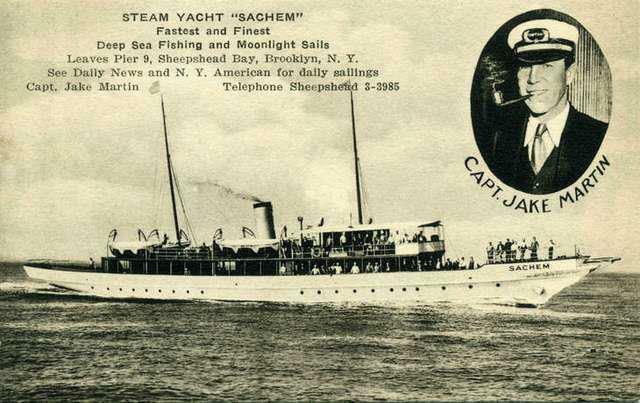 For further history and informations about the ship please see http://www.the-sachem-project.org. I speak on behalf of a group whose intention is to preserve the Sachem for a later (awaited) restoration. The Worst Flood Of Ohio River January 26, 1937..
"I Competed Against An Olympian...."
It's A Wild Animal....Isn't It??? Is It Really Utopia Along the Ohio River? ?